Miami-Dade County Public Schools has partnered with Carnegie Learning for more than 15 years, resulting in significant student achievement in mathematics. The district recently released assessment results that speak to the power of this partnership. "Our students continue to soar academically as evidenced by the results of the Florida Standards Assessment," said Schools Superintendent Alberto M. Carvalho. 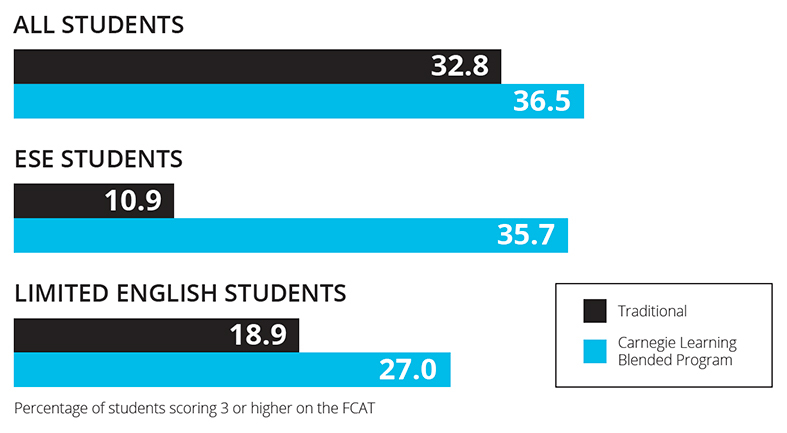 On the FSA Mathematics assessment, M-DCPS students in all Grades 3 through 8 outpaced or matched the state in terms of gains from 2017 to 2018. The district created innovative learning environments in these schools, including large open spaces, flexible furniture, and cutting-edge technology. Students are given group instruction as well as time to work together in small groups and present their work to each other, even writing on the walls! A recently published, peer-reviewed study3 demonstrates high correlations between measures of consistent and highly proficient usage in the MATHia adaptive software (e.g., content completed, efficiency in mastering skills) and performance on the Florida Standards Assessment (FSA) for mathematics. Such performance measures contribute to the calculation of MATHia’s Adaptive Personalized Learning Score (APLSE). The graph below shows actual and predicted FSA scores for more than 11,000 students using MATHia. 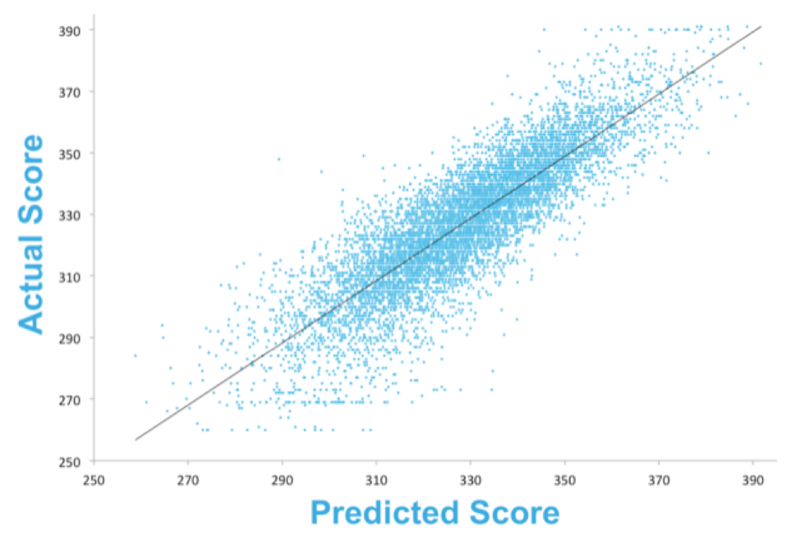 Each dot represents a student, and the fact that most dots are clustered around the trend line indicates that MATHia usage is able to accurately predict actual test scores. Dr. Molina continues, “We have also worked with Carnegie Learning to provide in-depth professional development and job-embedded coaching support to 49 schools (approximately 137 teachers) per year. Teacher feedback is always very high, and comments usually include that it is one of the best professional development sessions they have ever attended." These results aren’t new. Evidence for increased student learning with Carnegie Learning solutions in Miami-Dade County Public Schools emerged early in this long-standing partnership. In 2002, the Reliability Group, an independent third party, conducted a research study involving 6,395 high school students. The study concluded that students using the Carnegie Learning curriculum scored significantly higher on the Florida Comprehensive Assessment Test (FCAT) than students using a different curriculum. The difference was particularly pronounced for Exceptional Education and Student Services students, including those with learning and behavioral difficulties, and for students with Limited English Proficiency. “We are thrilled by the results that Miami-Dade County Public Schools has seen, and look forward to continuing our partnership to help iPrep students experience deeper math learning and build critical 21st century skills for a successful future,” says Barry Malkin, CEO of Carnegie Learning. The Carnegie Learning curriculum, both textbook and software, have been vetted by our team for alignment and rigor, and we have found it to be highly correlated to the tasks our students need to be proficient on as per our Florida Mathematics Standards. Our students continue to soar academically as evidenced by the results of the Florida Standards Assessment.